Formative assessment is a planned process that provides information needed to adjust teaching and learning while they are still happening. It guides you in making decisions about future instruction and informs your students so they can adjust what they are currently doing. What’s the difference between formative and summative assessment? Traditionally, you may have used assessments to measure how much your students know at a particular point in time, and whether or not your students are meeting state, district, or your own classroom standards. This is called summative assessment and it occurs at the end of learning. It’s used to make judgments about your students’ competence and can be used to collect formal grades. Formative assessment is a process that happens throughout the learning. It is used to make adjustments by both yourself and your students so that learning goals can be met. It occurs before a summative assessment. Formative assessment data is not meant to be used to collect formal grades. 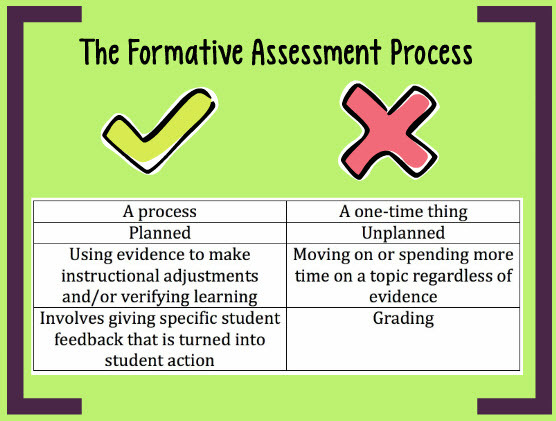 Let’s take a look at what formative assessment IS and IS NOT. What are the types of formative assessment? Are you typically utilizing more of a summative assessment style or a formative assessment style? Stay tuned for my next blog post that explains why you should be using formative assessment in your classroom and how you can gather and use formative assessment data to improve your students’ writing.